Those of you who are conversant with Swissgarde products will appreciate the fact that they generally have a beneficial effect on the immune system of an individual. But when it comes to modulating your body’s defense system, Sterols and Sterolins found in the all-important product African potato needs to take the center stage. We shall also be finding out the key difference between sterols and sterolins as an immune modulator and the herb Echinacea, which helps in boosting the immune system. Some may find this material a bit technical, but if you calmly and patiently go through it, you will have a lot to gain from it. Sterols are plant fats found in all plant-based foods. Sterols, including cholesterol, are in the same large classification family of steroids but they do not have the negative effects that often are associated with steroids. Sterolins are glucosides, which are molecular structures joined to the sterol. Sterolin is easily destroyed, and without it, the sterol does not have the same immune-enhancing benefits. In nature, plants never contain sterols only. The sterols are always associated with their glucoside sterolin. 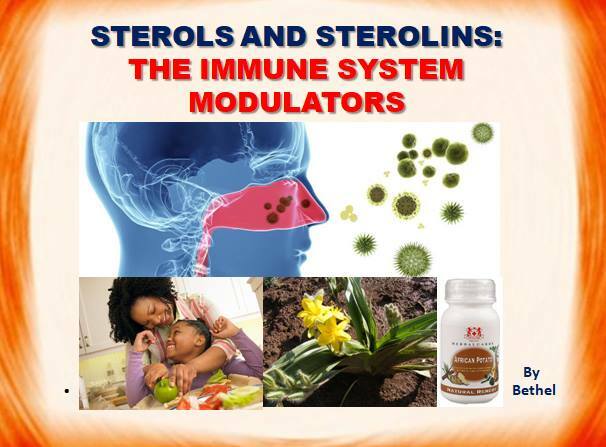 Now, before we consider how sterols and sterolins elicit immune system regulation or modulation, let us understand the immune system. The immune response has two ways of dealing with foreign pathogens. The B-lymphocytes synthesize specific antibodies called immunoglobulins. This is known as humoral immunity. The other system involves T-lymphocytes, which regulate the synthesis of antibodies as well as direct killer cell activity and the inflammatory response of delayed-type hypersensitivity. This system is known as cell-mediated immunity. The T-cells are further divided into helper lymphocytes (Th) and cytotoxic cells (Tc), also known as suppressor cells. When the T-cells encounter a foreign pathogen (antigen) they further secrete a number of communication molecules called lymphokines, cytokines, interleukins or interferons. These factors further elaborate and direct the immune response to a specific antigen. The whole process is a symphony of many co-factors, which are orchestrated into a sophisticated immune response. The T-helper cells are directly involved in assisting B-cells as well as coordinating their own cell-specific defense. The T-helper cells are further divided into two distinct lines of defense. The Th1 cells promote the cell-mediated line of defense and inhibit the other line known as Th2 cells, which regulate the humoral defense. The Th2 cell lines control the B-cells and inhibit the cell-mediated response of the Th1 lymphocytes. A careful balance between these two functions is thus achieved. When one line of the above response predominates, there is the opportunity for immune dysregulation to occur, resulting in either a hyper-immune response causing an autoimmune disease or a hypo-immune response resulting in an uncontrollable infection such as AIDS or tuberculosis. The Th1 helper cells secrete lymphokines such as interleukin-2 and gamma interferon. Th2 helper cells secrete pro-inflammatory lymphokines such as interleukin-6, interleukin-4, and interleukin-10. Interleukin-1 appears to be released in response to a specific injury and acts as an inflammatory mediator. Interleukin may be over-expressed in diseases such as rheumatoid arthritis and osteoarthritis. Interleukin-1 deficiency is associated with metastatic tumors, nutritional deficiencies, and certain autoimmune diseases. Interleukin-6 is associated with pro-inflammatory responses as well as mediating the proliferation and maturation of T-cells. High levels of interleukin-6 have been associated with a variety of autoimmune conditions such as rheumatoid arthritis, Sjogren’s syndrome, multiple myelomas and some cancers such as cervical and bladder cancer. Interleukin-2 is a growth factor for T-cell maturation as well as an inducer of T-cell cytotoxicity and natural killer cell activity. An interleukin-2 deficiency would cripple the cell-mediated immune response and its stimulation would enhance the overall efficacy of the immune system. Immune dysregulation occurs when the two sides of the immune response become imbalanced. This is where Sterols and Sterolins play a huge part. sterols/sterolins are adaptogenic in that they modulate the immune and stress response (See my other material on stress response ). This makes them extremely valuable adjuncts to the prevention and treatment of a wide range of stress-mediated disorders, as well as immune dysregulation and inflammatory diseases. WHAT IS THE DIFFERENCE BETWEEN STEROL/STEROLIN (FOUND IN SWISSGARDE’S AFRICAN POTATO) AND HERBS THAT BOOST IMMUNE RESPONSE, SUCH AS ECHINACEA (FOUND IN IMMUNE BOOSTER)? The key difference between echinacea and sterol/sterolin supplements is that echinacea only stimulates the immune system, while sterol/sterolin balances it. Echinacea is not recommended for prolonged use, or for people with autoimmune conditions. Sterols and sterolins allow the immune system to regulate itself: “upregulating” or boosting an underactive response and “downregulating” an overactive one. We are proud to announce that, African Potato, a patented unique blend of sterols and sterolins, derived from the Hypoxis plant is available in Nigeria, courtesy of Swissgarde, Contact your nearest Swissgarde distributor to get yours.